Mani Rimdu is main festival of the Khambu (Everest region). The 3 days long Mini Rimdu festival is performed at Tengboche Monastery (3860 m). Buddhist Monk wear mask and perform Mask dance over the Victory of Bon –Po Religion. This festival is celebrated during the 9th month of Tibetan lunar calendar which falls on October. People of Sherpa community attend to the Puja (worshipping). They pray paying homage to Guru Rinpoche. Mani Rimdu Festival is being celebrated since centuries around the full moon day. During the Mani Rimdu festival the monks perform 16 dances. All the monks of the monastery perform chanting and prayers following rituals according to the Buddhist tradition. The Tengeboche Monastery is situated at the top of the hill from where you can enjoy with the surrounding Mountain views. The spectacular mountains such as Mt Everest (8,850 m), Lotse (8,516 m), Amadablam, Nuptse, Thamaserku, Kantaga and many more other mountains can be viewed from here. The trek goes through the alpine pine and rhododendron forest. On the way, flora and fauna of various kinds can be seen. Different birds like Imperyan Pheasant, vultures, kites, etc. and animals such as Mountain Thar, Musk Deer, etc. are found here in abundance. 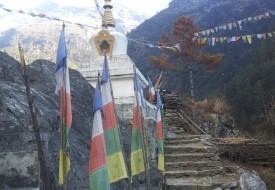 All through the way, carved big rocks and Buddhist prayer flags can be seen. Tengeboche Monastery was built in 1916 by Lama Guli. This monastery sustained a great damage by the massive earthquake in 1934 and a great fire in 1989 which had totally burnt it. Still, the people here have revived it and are continuing with the culture and tradition. During this festival, visitors will have a great chance to visit highland Sherpa people and experience their own unique culture. Copyright © 2019 Adventure Himalaya Nepal. All Rights Reserved.